Creeping buttercup is a hairy perennial which grows to about 15 cm tall from its fibrous roots to the tips of its flowering stalks. Stalks grow from rooting stolons (runners) which can be up to 100 cm long. Several flowering stems spring up from the central rooted nodes and creep outwards. The stems support pale-spotted dark-green leaves which are toothed, lobed, and generally triangular in shape. Distinctive shiny butter-yellow flowers crown the stems. Flowers usually have five petals (although have been observed with six to ten) and are 10-35 mm wide. Ranunculus repens inhabits moist recently disturbed sites such as ditches, clearings, fields, pastures, and gardens. It is very common at low elevations in BC where humans have settled, and is often regarded as an invasive noxious weed. This plant was introduced to BC from Eurasia, and is now found all across North America save for the most extreme environments. 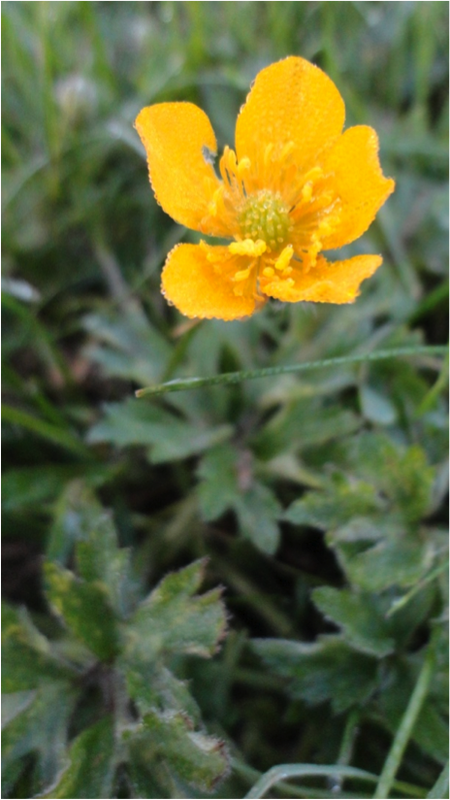 Meadow buttercup (Ranunculus acris) is a another introduced, hairy, large-flowered perennial which can be distinguished by its taller stems and lack of stolons (runners). Meadow buttercup occupies a similar environmental niche as the creeping buttercup and the two species often overlap in their habitat and range. Warning: creeping buttercup and many other members of the Ranunculaceae family contain the chemical protoanemonin which is a severe skin irritant which induces rashes, blistering, and swelling in contacted areas. Ingestion leads to nausea, vomiting, dizziness, spasms, and potential paralysis. The leaves contain the highest concentration of this harmful compound. Pojar, J. and MacKinnon, A. (1994). Plants of Coastal British Columbia. Vancouver, BC: Lone Pine Publishing. P. 176. 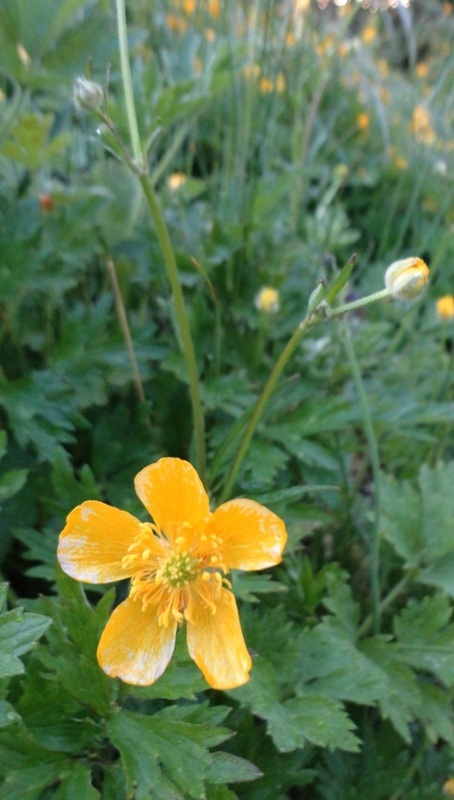 Ranunculus repens (L.) Ker Gawl. In Klinkenberg, Brian. (Ed.). E-Flora BC: Electronic Atlas of the Plants of British Columbia. Lab for Advanced Spatial Analysis, Department of Geography, University of British Columbia, Vancouver. Accessed 28/11/2014.